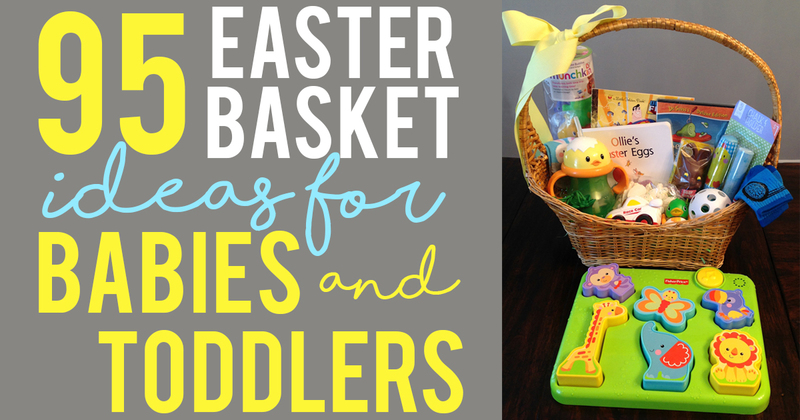 Looking for some Easter basket ideas for babies and toddlers? I mean, really, what in the world are you supposed to put in a baby or toddler’s Easter basket? They definitely don’t need loads of candy but yet we still want to do at least something for their first (or second) Easter. When I started to purchase things for my son’s Easter basket, I was at a total loss of what to buy. Everything in the Easter section was either candy or toys for older children. I remember spending hours time strolling through Target looking for things that would fit into his basket. I became desperate for Easter basket ideas for babies and toddlers – everything in the stores was geared towards older children. 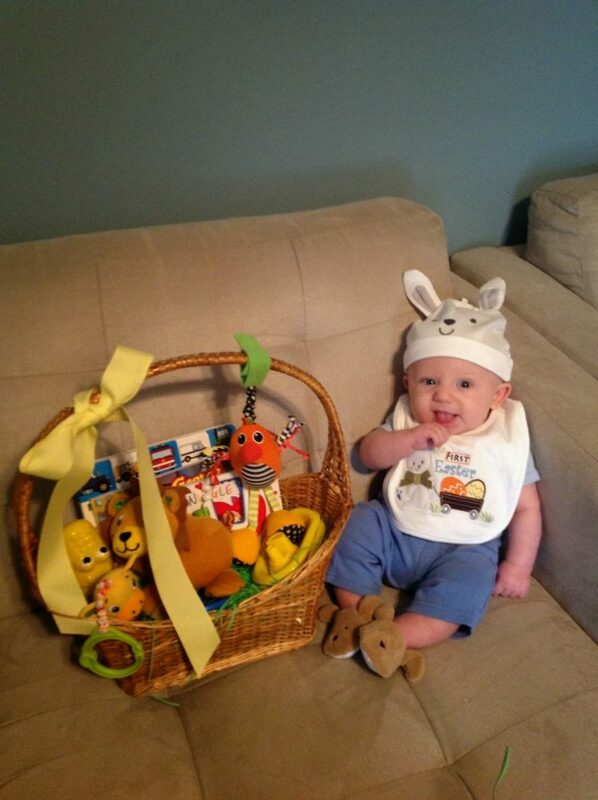 I don’t know about you, but for me, filling an Easter basket for a 3-month-old was difficult. This year, I had too many ideas. I couldn’t even fit it all into Carl’s basket! So I thought I would share with you Carl’s finished Easter basket. 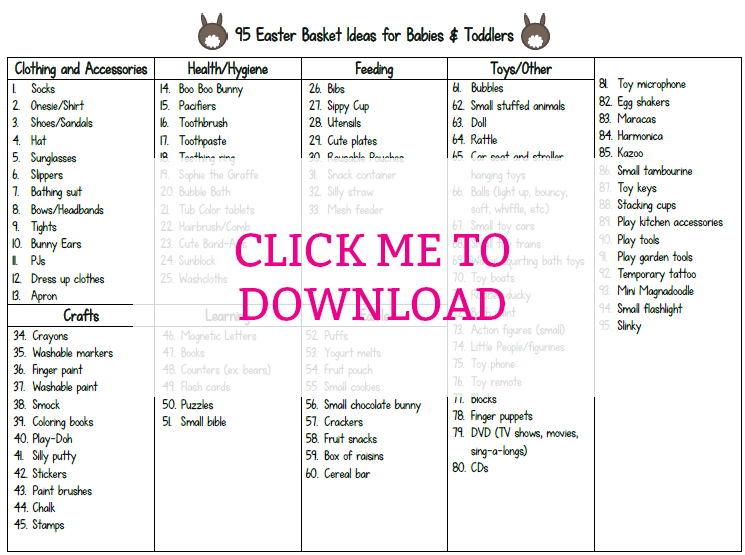 As a bonus, I have included a free printable list of 95 basket fillers for babies and toddlers! You can find it at the end of this post. 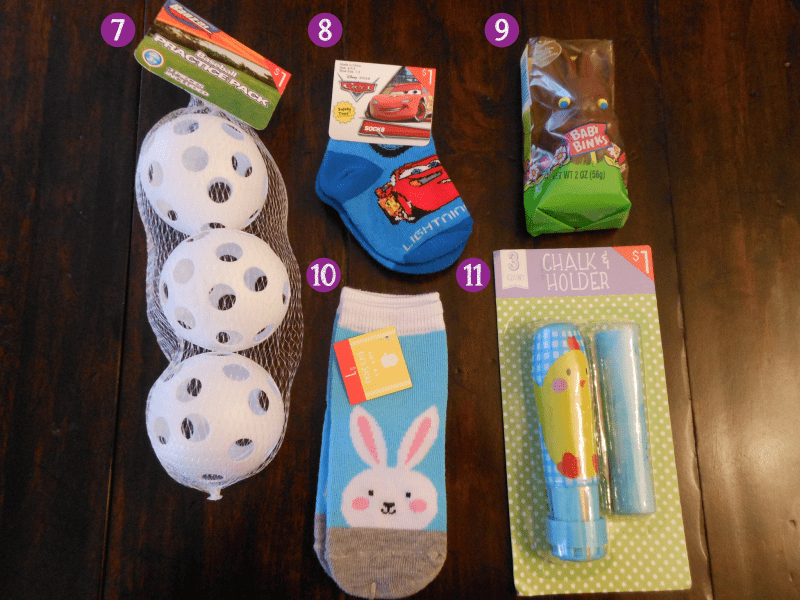 I found most of Carl’s items at Target (in the dollar section!) and online at Amazon. Since this basket was from a few years ago, I have updated it with similar items available currently on Amazon. His basket is my Easter basket from when I was a child. It’s the only real non-girly item I was able to pass down to him (not sure he’d be too crazy about my Samantha doll). 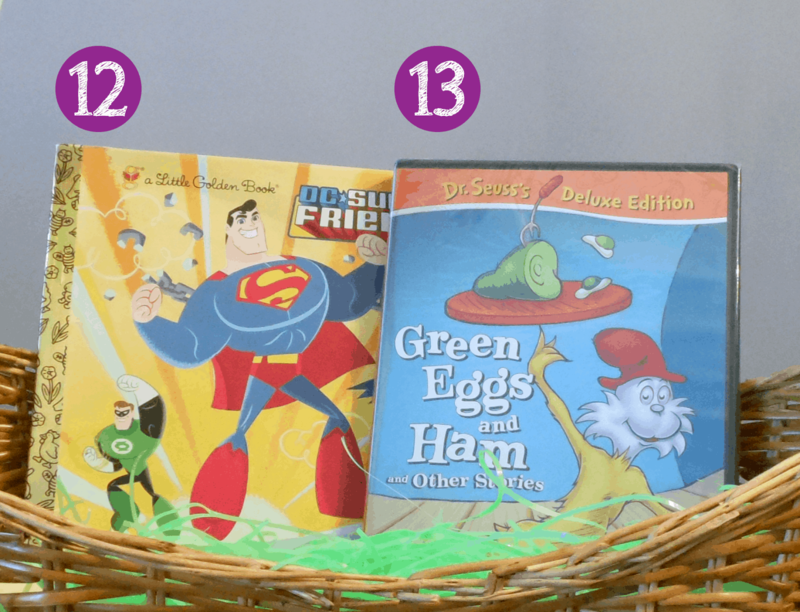 For those Amazon Prime parents, I have included links to numerous items perfect for Easter Baskets. 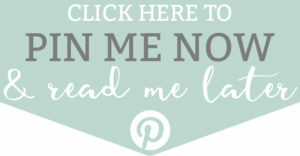 There are links throughout my post as well as a list at the end. This means you can shop for Easter in your pjs (and save money on most items while doing it). 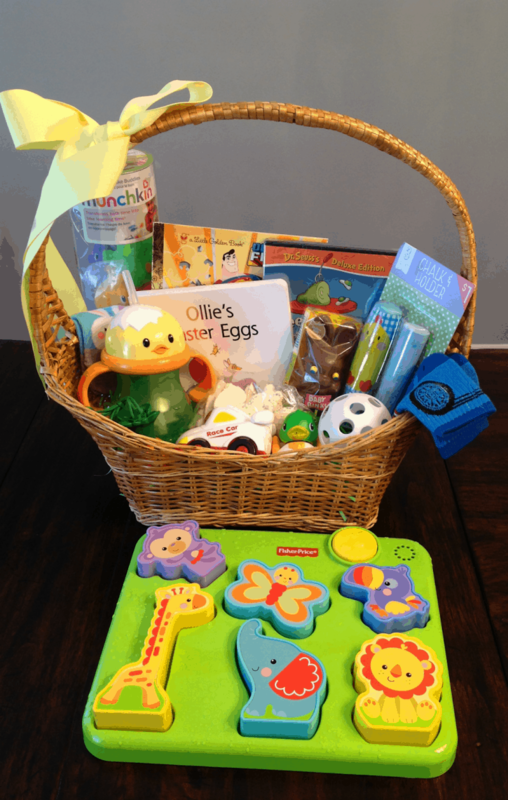 What’s inside of your child’s Easter basket this year? 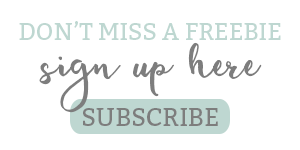 I would love to hear some more ideas so I can add them to my list! Looking for a custom non-candy item to put inside of your kid’s Easter baskets this year? 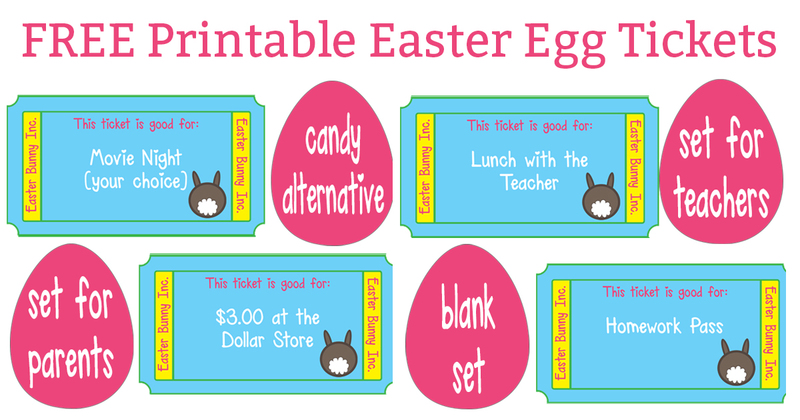 Check out these FREE printable Easter Egg tickets! 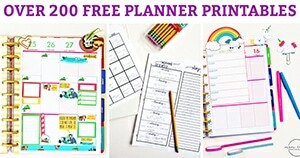 Perfect for parents and teachers. 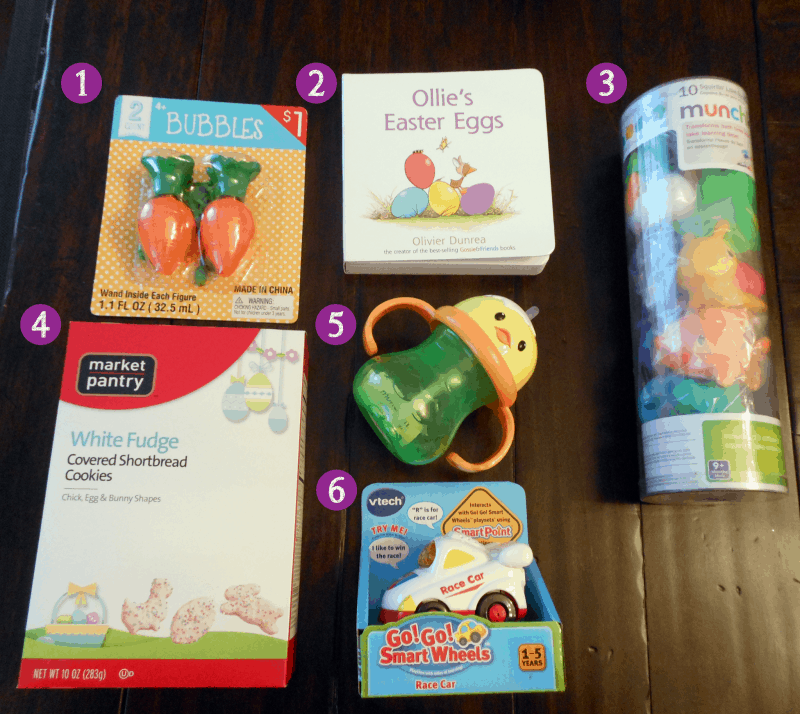 What was in my son’s Easter basket? We love Gossie & Friends books. They are so adorable! This is one of our favorites. 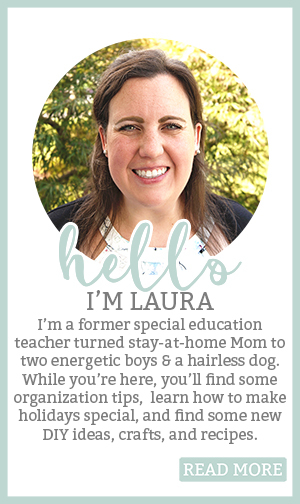 If you haven’t replaced your child’s in a while, you may want to. They get really gross inside! There are lots of different options. I linked to a multi-pack (the older car is still available but it’s more expensive). Although I was informed by my wiffle ball aficionado that these are not true wiffle balls… oops.. who knew there was a difference? (here are some from Amazon). Any baby or toddler socks would be a great basket stuffer (I included a link to Amazon’s toddler sock options). I can’t take the credit for this one, my husband grabbed this one day while out. I think he may be a little tired of reading all of the baby books. My son’s favorite story he reads with my husband is Green Eggs and Ham. He gets to excited so I can’t wait for him to see this! I may have overbought with this one…for some reason, I thought it would fit in the basket. 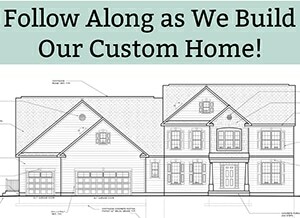 Want an easier way to shop? Check out my list on Amazon where you can see all of the suggested products in one easy location!! 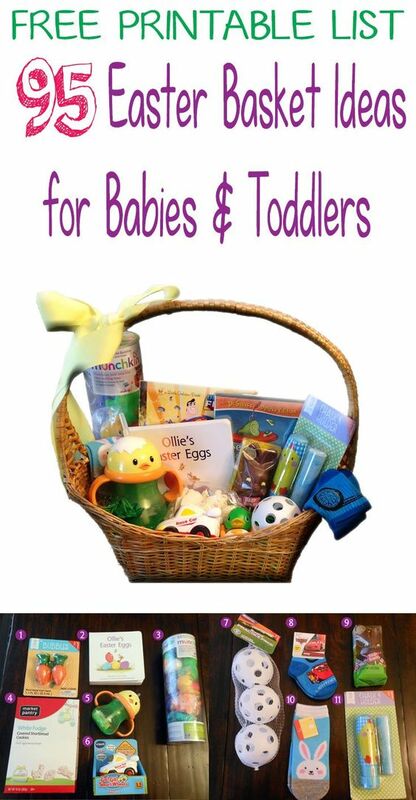 Click here to check it out – it’s under Easter Baskets for Babies & Toddlers. Perfect for books for babies. It provides a tactile experience with its various textures to touch and feel. My boys love these books by Laura Numeroff and Felicia Bond. This is a great choice for toddlers. How is carrot teether?? I wish they had these when my boys were little! This is a great set of outdoor chalk for kids. They are a triangular shape which is easier to hold and also keeps the chalk from rolling down the driveway. Playdoh in Easter Eggs makes the perfect basket filler. These drops will turn your kid’s bath water into fun colors. Make bath time a little more exciting. What toddler wouldn’t love to watch a slinky go up and down the stairs? This is definitely a toy for older toddlers. Bubbles provide a fun experience for kids of all ages. Perfect for babies or toddlers. This microphone also works as a rattle. Aren’t these socks precious? And they have grippies on the bottom (as my son likes to call them). Want to give your child some crayons? These egg-shaped ones will fill in a basket wonderfully. Here’s a sweet and soft way to care for a child’s boo boo after they fall. Plus, it will look adorable in the basket. This book provides little ones with an introduction to Bible stories. We have these snack cups and love them. They are a practical and colorful basket filler. Want to provide something edible? Replace traditional candy for kids with these for little ones. Aren’t these cute? Easter-themed rubber duckies. These come in a pack of 12 so they’re great for grandparents to get for their grandchildren, for kids parties, or to split with family/friends. Provide some entertainment for the bath with this tugboat. It’s a green toy, too. These garden tools will let your child pretend to help you in the garden. It will help keep them busy while you get some chores done. 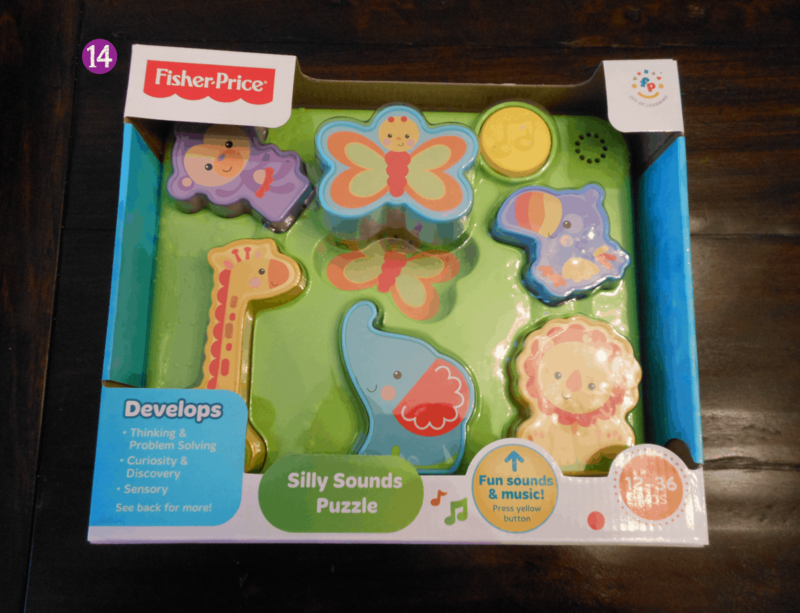 Maybe instead of a bunch of little gifts, you could splurge and purchase this set for your child to enjoy for years to come. This is exactly what i was looking for!!! Just a list of possible things to get!!! Thank you!!!! !